When I started, I went door-to-door posting flyers in my community, targeting the busy areas like tuck shops, the train station and library. Then I started receiving phone calls from people placing orders. The first month I managed to make my target, I couldn’t believe it. When you are not yet enrolled at TCB you think it is about business only, but once you’re here you realise there are a lot of things you learn and gain. Your encouragement and advice has boosted my self-esteem. I now know the importance of saving money. I even know how to monitor money going out, money coming in - yhoo this is good to know. I save money for holiday groceries and even going to Eastern Cape during December holidays. Thanks to Tracey for the vision of helping unemployed women to eliminate their tendency of sitting in the sun and gossiping and stressing. 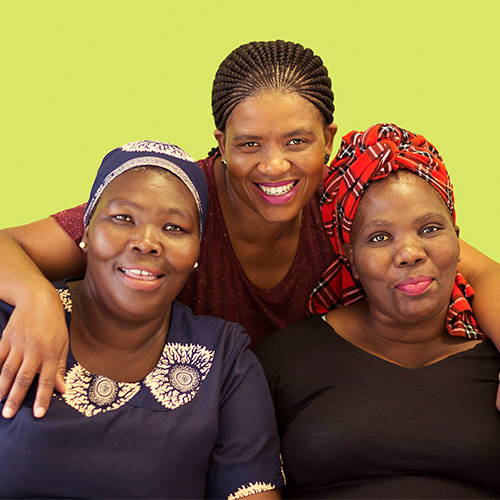 Nelson Mandela once said “Wake up and do your thing.” What TCB does in the community and keeps on doing for South African women amazes me. Wonderful are the works of TCB for touching women’s lives and giving them skills to stand up for themselves and eliminate poverty. I’m proud of where I am today because of TCB. I did not know that I would cope with the studies and training here. I’m now empowered. I’m proud of myself.